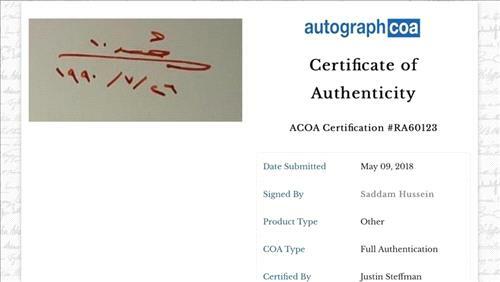 AMMONNEWS - E-commerce platform eBay has put on sale several handwritten documents by Iraq’s former president Saddam Hussein, giving orders for release of huge funds ranging in denomination between $2,000-3,000. The documents reveal orders from Saddam Hussein to government and security agencies and ministries, during his rule. One of the documents included an order to the ministries of foreign affairs and trade to provide 144 Cressida cars to the Arab Republic of Egypt as gift, and a gun made of pure gold to former Egyptian President Mohamed Hosni Mubarak. One document showed Saddam directing to the presidential office to provide a family one car and million dinar. In one of the most prominent documents, Saddam Hussein ordered flags to fly half mast, over government buildings, mourning the death of Saudi King Khalid bin Abdul Aziz.